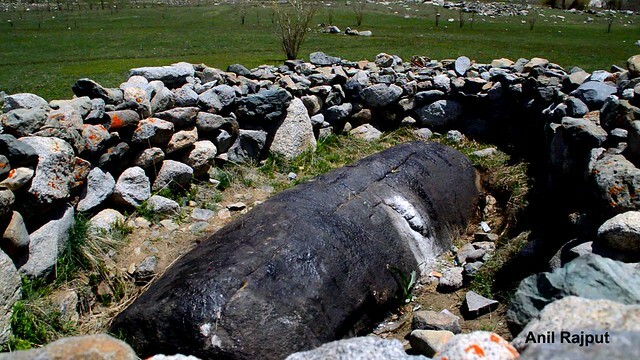 Bheem Bat is in Drass Valley is about 2 km from the Kargil War memorial 53 km from Kargil very close to the National Highway 1D to Drass – Kargil – Leh. While travelling from Drass to Kargil about two km from the Drass War Memorial , on the right hand of highway there is a beautiful green meadow , one is to walk about two hundred meters in the open green area to reach near the Drass river, just before the gorge is a cylindrical black rock lying on ground about 7 ft. in length encircled by a wall of stones is Bheem Bat . 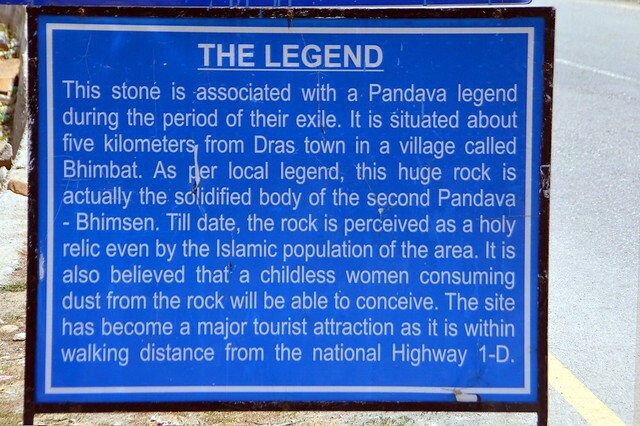 It is a piece of rock as per legend goes, it is a body part of Bheem a Pandava brother from epic Mahabharat , it moved overnight from the other side of mountain by itself. It is treated as a holy relic, locals Muslims and Buddhists believe that it has healing powers. the grass and mud around it is used in treating the Goats and Cows for increasing the quantity of milk . It is also believed that consuming the scratched dust from this rock by a childless lady results in early conceiving . Locals and the army men posted in this area visit this place regularly to pay their respect by lighting the incense sticks and oil lamps . 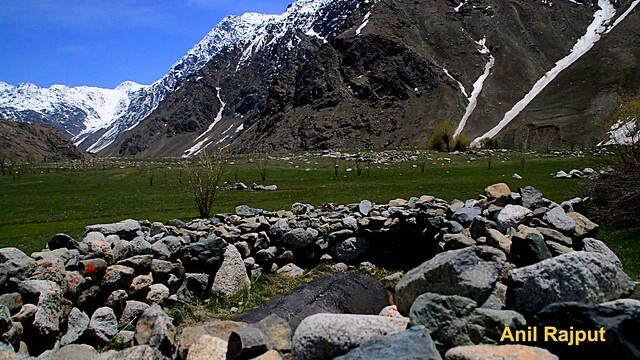 Drass Valley is a surrounded by snow caped mountains of Karakoram range , river Drass flows through it , one can enjoy the beautiful views of Tiger hill, Rhino Knobb, Tololing one one side and on the other side is Mun mun pass from where one can have view of beautifull Drass valley and India – Pakistan Line of control .